Silly question I know but can anyone tell me if it's ok to use a standard Graham Farish, Bachmann controller to run and try out a Union Mills loco? I am new to model railway electrics and read warning about half wave controllers being used on U/M loco's. Have not got a proper controller yet (for DC) am thinking of Gaugemaster. Re: Graham Farish, Bachmann controller. The Bachmann controller is designed for N and OO and doesn't do anything particularly special - it's just fine. Half-wave really relates to the half-wave mode on some of the ancient H&M controllers from the 1970s/80s. Most modern N gauge shouldn't be run with those controllers in half wave mode, or with a feedback controller unless specially designed for the job. Generic cheap controllers won't be doing feedback. Thank you Alan for your advice. Am using track and controller from a Grafar set for testing/running until I get my layout built. I have been offered a second hand Gaugemaster "D" controller for a low price and am thinking of popping in there shop to have it checked out. I've been told these are good controllers. offered a second hand Gaugemaster "D" controller for a low price and am thinking of popping in there shop to have it checked out. I've been told these are good controllers. Plain boring, no special features but very solid and reliable. The DF (red front) has feedback so should be avoided for N, the D is just fine. I use the Farish Bachmann controller from the Atlantic Coast set together with the oval of track to run in all my locos prior to chipping and putting on the layout, works just fine. Be aware that a 'lifetime guarantee' doesn't mean it's guaranteed for 'your' lifetime. It means it's guaranteed for the design life of the product, and that could be less than you think. They don't tell you the design life so fifteen years later when you try and get it fixed for free you'll find it had a ten year life. Thanks for that advice. I am looking for a dual controller and will be sure to look at the specifications. I still have the bachmann controller from my initial n gauge set. 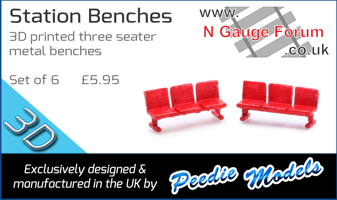 Use a gaugemaster d for my n gauge. I am thinking of using this for a small simple 00 gauge layout (basically an oval) purely to run a loco I really liked only available in 00. Just wondering if the n gauge controller will be ok to use with the 00 loco. Yes. Its the same controller as they use for the OO sets. The only difference with the one in the n scale sets is the clip onto the track. I’m a great fan of the Bachmann trainset controllers for testing. However I would sound a note of caution. At full throttle, ie setting 100, mine puts 22v on the track with no loco and 20v with a Dapol Terrier running as the load. Setting 60 gives around 12v, which is normally accepted as the maximum voltage for N. This is with the fairly heavy 16v AC transformer based wall wart as the feed to the controller. You can see where the 22v comes from. 16v AC is the RMS value. The peak voltage is 1.41 times this, which is 22v. Applying a bit of load will bring the input voltage to something closer to the RMS value. The snag with modern N is that the current drawn by a single small loco can be very small. I’ve not seen how the latest trainset controllers are powered. Do they still use the transformer based wall wart, or have they gone to using a regulated switched mode unit? I have two of these out of sets I have obtained about two years apart and both use wall warts. They appear identical. My only concern with them is that there is no indication if anything is wrong, a short etc. A loco just doesn’t move, which is okay, but it doesn’t help explain why they aren’t. Thank you everyone for your advice, it is very much appreciated. Page created in 0.245 seconds with 43 queries.